D-173, Cream Color, Hindu Cards. The opulence of royalty and class comes out so very effectively in this card. This cream-colored art sheet card design has self-embossed floral images with glitter detailing and a side mast of self-embossed border design and Ganesh ji over the orange ground as the front composition. 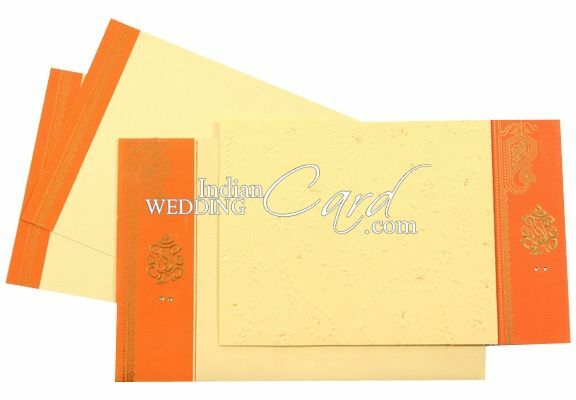 The inserts have the mast border of the front in the same orange and gold combination and the envelope too follows the Ganesh ji mast design of the front. Silk Screen printing in Orange color matching to the card front.